The new Volkswagen Atlas is a three-row SUV that seats up to seven passengers. There has been a lot of hype around the all-new SUV as it was the first VW SUV to offer third-row seating. The 2018 Volkswagen Atlas was built for the modern family and with a spacious and versatile interior the Atlas can accommodate any family needs. Contact Hall Volkswagen to find out more about the available 2018 Volkswagen Atlas near Milwaukee, WI. The 2018 Atlas will have the choice of two powertrains, the 2.0-liter turbocharged and direct-injection TSI® four-cylinder engine with 235 horsepower or the available 3.6-liter VR6 engine with 276 horsepower. Both engines are paired with an eight-speed transmission to help maximize engine efficiency. The Atlas can also be configured either as front-wheel drive or with available 4Motion® all-wheel drive in VR6 models. The 4Motion system has a Driving Mode Selection feature that allows the driver to select specific parameters based on driving conditions. The all-new Atlas was built for families and that is why Volkswagen made sure that the all-new three-row SUV has many available safety and technology features. The Atlas features an 8-inch touchscreen display and has Apple CarPlay, Android Auto and MirrorLink smartphone connectivity. The driver assistance features that are available on the new 2018 Atlas include Adaptive Cruise Control, Forward Collision Warning and Autonomous Emergency Braking, Blind Spot Monitor with Rear Traffic Alert, Lane Departure Warning and Park Assist. The Atlas is also the only vehicle in its class to offer the Automatic Post-Collision Braking System. The system applies the brakes when a primary collision is detected by the airbag sensors, helping to reduce the severity of the collision. 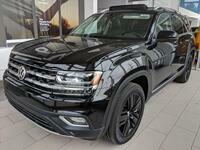 Contact us at Hall Volkswagen in Brookfield, WI if you are interested in learning more about the all-new 2018 VW Atlas or if you would like to schedule a test drive.